We’ve watched slow-motion flooding along our great rivers as the Corps of Engineers has breached levees and released water from dams to flood homes and farms in the Ozarks and along the Mississippi. Now a great slug of water is moving down the Missouri River to cause loss of property and perhaps loss of life, at great expense to public and private entities. Through private actions and vast public works projects, the damage from flooding seems to be aggravated. Why have we done this to ourselves? The river systems of the Upper Midwest evolved over the past 20,000 years, as the ice sheets retreated from as far south as the centers of Missouri and Illinois. Runoff from the melting ice sheets combined with the annual snowmelt to create the modern Missouri River, which abuts the north border of the Ozarks in its last 200 miles before entering the Mississippi. The wide floodplains of the Missouri and its tributaries were created over thousands of years as the rivers undulated horizontally within well-defined boundaries, depositing silt over the entire floodplain as seasonal high water levels receded. In the Ozarks, south of the glaciated area, streams have been carving their way downward through the rocky plateau for eons, generally running away from the highest areas of the Ozarks, north to the Missouri River (the Niangua via the Osage, the Maries, and the Gasconade, the Meramec and the Big, among the larger tributaries) and southeastward (the St. Francis, the Black, the Current, the Eleven Point and the White), to the Arkansas and Mississippi rivers. The past landscape supported populations in cities (Cahokia, among others) and small villages. Accounts of the Mississippi and Missouri rivers in Mark Twain’s Life on the Mississippi and in the journals of Lewis and Clark illuminate the character of these broad, shallow and ever-changing waterways, teeming with wildlife, bounded by bottomland jungles. Henry Schoolcraft and Silas C. Turnbo described the rivers and creeks of the interior of the Ozarks as they appeared in the early and mid-19th century. Toward the end of the Turnbo passage, he describes the difference between the high-water and low-water levels of the White River to be 36 feet within 1898, while a 15-foot fluctuation causes enormous damage today. Under the perceived security of flood control structures, we’ve made ourselves vulnerable. As population increased, great economic opportunities appeared that were dependent on controlling the rivers. The control mechanisms, aimed limiting inundation and maintaining a navigation channel, created vulnerability in exchange for promised economic opportunities. The engineered structures of the Mississippi floodplain are well-known or at least well-documented. John M. Barry’s Rising Tide: The Great Mississippi Flood of 1927 and How It Changed America is masterful account of the engineering feats and political maneuvering that resulted in the channelized lower Mississippi. Thad Snow‘s writings about the effects of floods on the sharecropper population of Missouri’s Bootheel provide a sharply local point of view. The levee system and the system of locks and dams on the Mississippi, enabling navigation by huge strings of barges, combined with crop farming in the drained delta to provide major components of the North American agricultural economy. This is a man-made disaster, the legacy of an earlier generation of politicians, farmers and ranchers who made a lot of bad (and very expensive) decisions to correct short-term problems on the Missouri River when the best available science — including findings in a 1934 Corps report — warned Congress that those solutions would create dire long-term consequences. In the Ozarks, federal modification of streams has taken two forms: multi-purpose impoundments and federalizing of portions of the Jacks Fork, Current, Eleven Point, and Buffalo rivers. Like the projects on the Missouri and Mississippi rivers, these projects displaced thousands of small landowners and turned local streams into small pieces of federal management plans. The projects created economic opportunities, providing construction jobs initially, as well as providing a foundation for tourism, manufacturing of boats and accessories, and electrical power. What about flood control? Before Table Rock Dam was constructed, flooding on the White River in Branson and Hollister sometimes reached levels more than 10 feet higher than the post-dam record reached a month ago. However, before Table Rock Dam was built, there was much less in the way of housing and other kinds of development in the floodplain, but there was more agriculture. Some people, through a combinations of intellectual ability, education and personality, can tell us more about our physical and social environment than we could perceive ourselves. Can we trust the points of view of these people? Paul Vandevelder and the late Marc Reisner are strident in their denunciation of dam-building and the other aspects of massive pork-barrel projects that have fattened engineering and contracting firms (and their suppliers), enriched agribusiness giants, and concentrated political power, creating great wealth for a few from the destruction of big chunks of the natural world and forcing relocation of people, primarily poor. Thad Snow, a progressive (or you might say “radical”) farmer, drained 1,000 acres of what he called “Swampeast Missouri” before reaching the conclusion that wild lands should be left alone. He became an advocate for the descendants of black slaves whose meager way of life made them completely vulnerable to floods. But America needs to know that our great flood control projects weren’t built for motor boats, river chutes, and pallid sturgeon. They were built for a reason by the greatest generation who knew that you don’t fight life and death wars to a draw. Food, air, and water are essential to both life and freedom; flood control projects were built for a reason. It’s time to remember what that reason was. Similarly, but from a different angle, MSNBC commentator Rachel Maddow, also argues that the Greatest Generation built the infrastructure that made America great and that we’re risking future jobs if we cut federal spending for infrastructure projects. It seems indisputable that public works projects have economic benefits and moral hazard. The direction of revenues raised by taxes to specific projects spurs economic activity. A part of the economic benefit of water projects is flood protection, so that roads, wastewater treatment plants, houses and business buildings, with private investment, are constructed in floodplains. Crops are planted in floodplains. Flood insurance and crop insurance are available, through government-sponsored programs, and the insurance premiums at least partially offset the public cost of the moral hazard. Private owners pay property taxes on structures in floodplains. Should we invest more, as Richard Oswald suggests, extending the life of the flood control projects of the 1940s? Should we encourage the continuation of projects such as the wetlands reserve program (WRP) that pays farmers to allow riparian cropland to become marshland and bottomland forest? Will WRP and Corps of Engineers’ wetland restoration projects make a real difference in the intensity of flooding and the future of the pallid sturgeon? My fear is that the various federal programs have contradictory effects in part and that the net effect is too small. We don’t receive the potential economic benefits, nor are the environmental degradation and flooding risk abated. But each program is responsive to a constituency that helps to keep a congressional representative in office. Would we be better off in the long run by investing in the disassembly of malfunctioning infrastructure and buying out structures in floodplains? What do we do with a reservoir that has lost its storage capacity due to silting, dredge or drain? What scale of wetland restoration is necessary to make it really work? I’m interested in knowing how other people think and feel about these issues. Please comment. Darn it, Harry! You stole my thunder. My “Ozarks Meanderings” column I’m working on for “The Ozarks Mountaineer” is about this same subject. Now there are some things I’ll have to quote you on! I’ll post more thoughts/ideas about the topic later on. I’ll forward your article to lots of vocal folks; they may wish to comment! Shucks, they may help me write the column, too! I may have stolen your topic, but I doubt if this blog’s audience is large enough to spoil the topic for The Ozarks Mountaineer’s readers. But, please, do what you can to generate some thoughtful commentary. As you might guess, I’ve spent a LOT of the last month contemplating and reporting on flooded rivers. As far as the Missouri goes, I’d like to recommend this book, The Dammed Missouri Valley by Richard Baumhoff (1951) as a comprehensive, near-contemporary account of the Pick-Sloan Plan which put the Mighty Mo in the shape it is in. This is out of print, and apparently out of copyright as a variety of digital versions are available for free at http://bit.ly/iWddRG. It’s generally a piece of reporting, not advocacy, and does a really good job of telling the history behind the Missouri River Master Plan, and the politics at many levels over 70 years which resulted in nearly all the grief the Missouri gives us today. Another good case study is Damning the Dam, by T. Michael Ruddy (1992) which is an Army Corps retrospective document on the Meramec Basin Project, its inception, citizen controversy, and ultimate defeat…Search the World Cat library system for a copy near you. It’s a very readable (and remarkably even handed) account of the manipulation of the Meramec from 1915 to dam deauthorization, and a little beyond, talking about resulting greenways an ultimate disposition of project lands. The reason we’ve gotten ourselves into the floodplain mess is partly lack of riparian planning oversight starting in the 1700s when towns were built right on the riverbank and the tragedy of the commons, in which individual floodplain actions, none of which is evil by itself, concatenate themselves into an overall negative pattern, with no individual willing to break the chain, lest he or she be put at a disadvantage from the neighbors. Add to this the conflict between the federal, and essentially military, mandate for interstate river management (Army Corps of Engineers being in charge of navigable streams, with an emphasis on the Army aspect) coming into conflict with private political, economic, property rights and recreational interests and it is a swirling stew of what should/should not happen. By the way, I personally think Maj. Gen. Michael Walsh, and Col. Vernie Reichling of Memphis District made the right call in the case of Mississippi County, Missouri. The scale of last month’s floods demanded extraordinary action. You could see in their faces in the news conferences that the blowing of Bird’s Point levee was not an action taken lightly, and they knew the ramifications would echo for years. It really wasn’t about Cairo, IL. It was about choosing the lesser of evils, directing floodwaters where it would do the least damage to the least number of people, rather than allowing the river to choose where the levee would break, perhaps at midnight, with people asleep in their beds at New Madrid, Caruthersville, or even Memphis. People have forgotten how to live with natural rivers. Until and unless they learn and/or choose to remember, having people managing rivers is a necessary task. Thanks for the links and for your insights. I read a chunk of the Baumhoff book, which was very chatty in tone but meaty in content. However, it was published in 1951, before the long-term effects of the Missouri River projects under the Pick-Sloan Act were known. My wild guess is that the impoundments on small tributaries have been very helpful to farmers and ranchers for recreation, irrigation and livestock watering, but that the flood control and hydroelectric benefits of the major impoundments are greatly compromised by silt. My thinking is probably tangential to the points in your essay, but I’ve been thinking lately whether we need to have some kind of pseudo-military service for dealing with natural disasters and the control of nature. The idea is not really mine. In his essay on a Moral Equivalent for War, William James suggests this very thing. His idea was that such a thing would provide the discipline and sense of purpose that people need. Lately it seems that not only floods, but hurricanes, fires, and tornadoes also seem to be wreaking havoc on what we have built. You might argue that floods are more predictable than tornadoes, but this seems more a question of degree than anything else. It just seems to me that our technological progress seems to be meeting head on with nature on several fronts, and the social and political responses are lacking. It’s possible that nature is getting more violent because of climate change, or it’s possible that we have more people and structures available for destruction. Our current strategy of build and then not really be prepared to maintain seems unsustainable. Arguing that wild lands ought to be left alone seems unsatisfactory since all lands are in essence wild lands. Engineering alone cannot solve the problem either. I think the valid solution would lie in finding ways to maintain as we build. Unfortunately the US, a rather new country, has no tradition of maintaining anything. Colleges can find money and donations to build, for example, but not to maintain what they build. I agree that the build-but-not-maintain strategy does serve to enrich the fat cats, as do our current military campaigns which likewise conquer but cannot maintain. William James idea of a pseudo-army to fight nature (I think that is the way he puts it) might not only provide discipline and sense of purpose to youth, but also become more and more of a necessity. The Civilian Conservation Corps was such an organization, and it provided a way for young men to work on projects for the public good within their regions, putting a little cash in their pockets that they could use to assist their families. We see their work at many state parks in the Ozarks, often in the form of beautiful masonry and timber buildings and bridges. The skills learned by the CCC guys–including how to work with others–were valuable. The changes in the nature of our government and our culture makes me wonder whether such programs would be embraced by today’s young men and women. The CCC participants were paid $25 per month in the late 1930s, which would be equivalent in purchasing power to $400 today. The lure of $400 per month, with 80% of it being sent to the worker’s homes, would be scoffed at, I’m afraid. How much would it take to lure an unemployed 19-yr. old to take a public service job involving tough manual labor and few frills? I think your point about our lack of concern with maintenance is on target. Our government’s policies of post-World War II have been to encourage the building of new structures without a financing program for maintenance has several unfortunate effects. For example, the massive subsidies through mortgage insurance for new single-families homes provided a disincentive for the maintenance of older housing in small towns and cities. At the same time, the funding preference for highways rather than railroads also encouraged the proliferation of a more energy-intensive transportation system and less compact cities. Now we have inadequate rail systems and rights-of-way for railroads, even though our population becomes more dense. Where we need several parallel tracks for high-speed intercity passenger trains, as well as commuter trains and freight trains, we have only a single set of tracks and not much siding to allow trains to pass. Our rail stations and railyards have been mostly abandoned. Now we have a massive infrastructure of inadequate highways and inadequate railroads, without enough money to maintain them. Harry, I appreciate the opportunity for such a discussion as well as the preceding comments. While I don’t pretend to have the answers to such a complicated topic either, I’m certainly willing to throw in my two cents. I think there’s no denying the benefits that have been provided from our river infrastructure. The incredible, though often overlooked, extent and ingenuity of our engineering has brought additional prosperity for agriculture, commerce, tourism, and electrical generation. And, even Mark Twain, often quoted for his remarks regarding the Mississippi’s ability to “tear down, dance over, and laugh at” any attempt to confine the river, also later admitted, though languishingly, our ability to make the river bend to our will. However, regardless of our engineering success its ultimately on borrowed time. The draining of our wetlands and construction of levees and dams were done in times of prosperity, such as Twain’s Gilded Age and the Post-World War II boom that put the Greatest Generation to work. The rivers will, in one way or another, eventually regain control of their course. I think the critical question for us is whether we continue to merely pay the interest on our loan from nature by maintaining infrastructure that works against the flow of our rivers and requires expensive and increasingly frequent payments in the form of repairs to towns, homes, businesses, and the land itself or we begin taking advantage of the environmental services provided by our natural landscape. However, while I think programs such as the WRP and other wetland restoration programs are a step in the right direction, such efforts still rely on dwindling public resources. Adjusting policy to provide additional funds may be beneficial, but even if such adjustments did away with contradictory policies that encourage cultivation of marginal land and development on floodplains, as you mention, the extent of public funds may not be sufficient and would continue to rely on somewhat random placement based on the inclinations of private landowners. Ultimately, I think the answer lies in societal recognition of the services provided by nature and the development of the “land ethic” described by Aldo Leopold more than sixty years ago. This would establish not only the will and pressure to provide compensation to landowners but also the public expectation of stewardship in return. Development of a “land ethic” can certainly be influenced by policy but probably relies more on spending time with our children in the woods, on a river, or simply in the backyard rather than taking a trip to the mall. I agree with Mr. Muckerman that adequate social and political responses to increased natural disasters is lacking, and I fear that an adequate response will require a much greater degree of discomfort with manifestations of our impact on nature coming much later than the initiative to respond. However, I do hope it takes the form of a land ethic which embraces our modest place in the natural world rather an effort to further control nature. I recently ran across several pieces about this topic. The position of geologists on this topic is unsurprisingly that floods (as well as other natural ‘disasters’) are frequent phenomena and that people should be more aware of what they are doing and where, and generally to avoid hazard-prone areas rather than try to ‘manage’ the hazards. Interesting piece; thanks to all who have written on this. Like Ed Cox, I don’t pretend to have answers to this, and I’m much less read on this subject than others in this discussion. I’ve tended toward “let the rivers run wild” and for goodness sake, don’t build in a floodplain of any age! Why take the risks? Those lands are much better suited for agriculture and ranching, but that said, I’d love to see better controls of animal excrement going into rivers and streams. We live on the West Fork of the White River in NW AR, and though people swim in it when there is water in it (it has a very small watershed and is frequently quite low), you’re swimming with a fair amount of cattle excrement. One of the feeder streams to the river, near us, is frequently green with algae and covered with scum from too much nitrogen due to cattle excrement. It seems sensible and responsible, to me, to require property owners to fence their cattle off of the streams. Would that cost them money? Yes. But are they polluting what should be a free common good, until the point that it is captured and sold as drinking water? Yes. Anyone who owns property on the river should be able to use it without excess pollution by excrement of any kind. We regulate septic systems to protect water sources, and other businesses, why not the livestock industry, whether hobby or commercial? On another note, I’ve not seen anyone comment about the value of the lakes for drinking water purposes. That to me seems the best rationale for damming a river. I’d like to hear your thoughts about that. I came across your blog while looking for info on the Missouri River projects and proposals of the past; I read the article in today’s New York Times about the proposed new project to run water from the Missouri River to the ever-diminishing Colorado River. It sounded familiar– I just read Marc Reisner’s book “Cadillac Desert” a few months ago, and this sounds like one of the hare-brained water projects that were proposed back in the sixties or seventies. I’m perusing my (electronic) copy of the book to see if this is a rehash of an old project that got shot down. Very glad to have found your blog– look forward to reading it. I became interested in the impact of federal water projects after reading a friend’s master’s dissertation/book on the impact of federal water projects on riparian systems, something you touched on in this post. People tend to look at dams as a “free lunch” environmentally, and clearly they’re not. Intense competition over water supply is extending eastward. Interbasin transfers can be counted on to have a few unanticipated consequences. 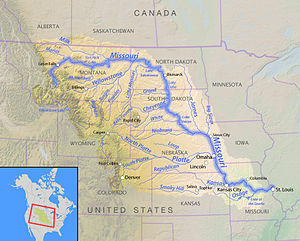 Besides the west vs. east conflicts, there are sometimes north-south disputes, such as over the proposed Garrison Diversion project in North Dakota that would have transfered water from the Missouri River to the Red River of the North. A geologist friend of mine (Joe Hannibal, who works–last I knew–at the Cleveland Museum of Natural History) reminded me that there is a north-south continental divide and that the construction of canals in Ohio in the first part of the Nineteenth Century allowed various organisms from the area north of the divide to enter into the Ohio River.